The NM spring winds are in full force this weekend and pretty much put the kibosh on any outdoor cooking. While the winds have extinguished the fires in my pits it didn’t blow away my desire to cook up something tasty. This weeks creation is something that is actually good for you. And being the meat guy that I am, you’re not going to believe what I made, Green Chile Kale Chips! 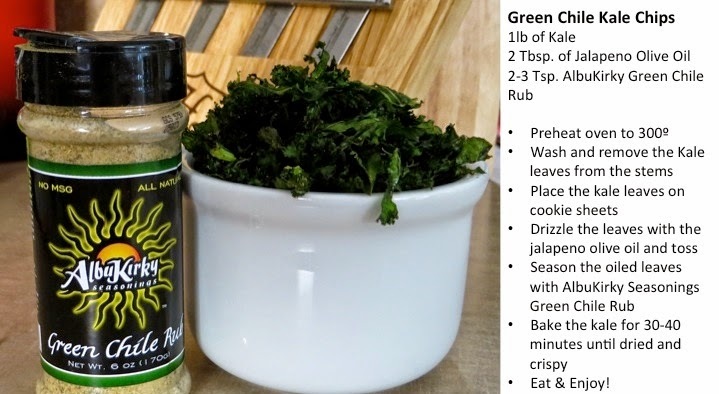 These kale chip were really easy and delicious. I’ve been eating on them all day and I feel uber-healthy. I’m sure I will live to 100 now! Give them a try and let me know how they turned out. I’ll be back next week with a special Cinco De Mayo post.